I am about to land in Delhi for the launch of the South Asia edition of my novel, Uncertain Light. I’m part of a still-rare breed – being published by a go-ahead new independent, Speaking Tiger Books. Ravi Singh, the co-founder, said, ‘We’ll publish 35 books this year, 50 in 2016 and grow to about 80 by our third year. And there’ll be many new voices.’ I am one, contributing to what will become their International Fiction Series. Does that make me a Speaking Tigress? I’m not sure I’m as confident as that sounds. A series of events has been planned – but will anyone come? This is a country of 1.3 billion people, with 22 official regional languages, each with a lively literature of its own. At the last official count only 5% of men and 3% of women were said to speak English fluently. OK, that’s 52 million people, but how many of them read novels? And if they do, there is a flourishing world of Indian novelists writing in English, so really, what am I doing here? As always, arriving in Delhi feels like dropping into a maelstrom. It seems vaster, busier, more confusing than I had remembered, and to handle it I need to find a small space to retreat to. 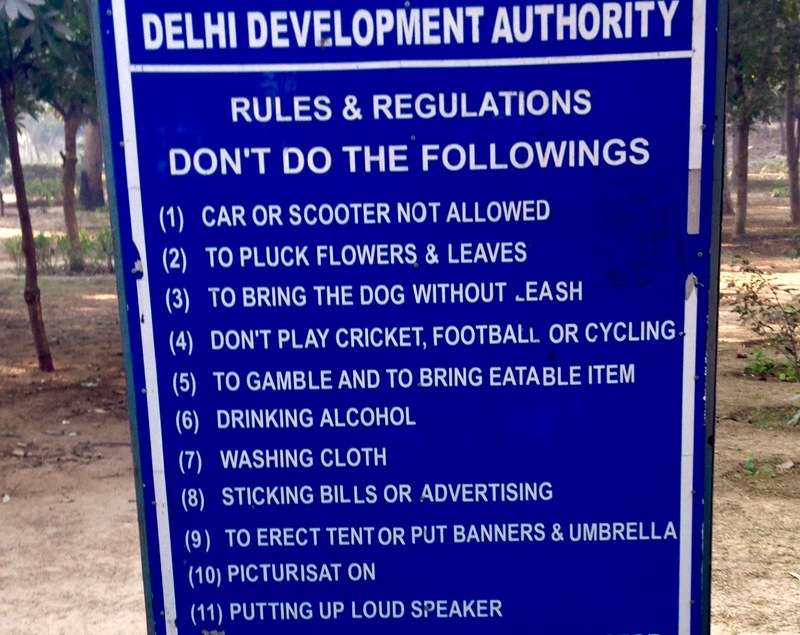 Then I move on, pausing to watch a lively cricket match – DON’T number 4. A ruined mosque emerges through the trees, one of the many ancient monuments that spring up like surprises throughout Delhi. Probably 15th century, the signboard says; nothing else is known about it but it’s in current use as a place to hang clothes out to dry – DON’T number 7. Hindu bhajan singers have gathered in the park’s central covered area, loudspeaker turned aggressively to max – DON’T number 11. There’s an echo of a moment in Uncertain Light. Rahul Khan, the central character, grew up in Delhi, son of a Muslim father and Hindu mother. His father wakes to the sound of bhajan singers who have positioned themselves strategically opposite the local mosque. It was an image from the time I was first in India, the 1980s, when communal tensions simmered, exploded, simmered again. They never go away. Once again Hindu-Muslim and caste-based violence are headline news. The world’s media are focusing on Islamic fundamentalism and have hardly noticed that there’s a strident Hindu fundamentalism on the ascendant here. I have some sense of it through articles friends have been posting on FaceBook; now I’m trying to follow events in the newspapers but I don’t know enough about the backgrounds of political figures whose names keep cropping up. I am having to learn all over again how to get about in dependently in this city. Almost all my friends have a driver who is summoned when they need to go anywhere. He waits off-stage till the meeting is over, then reappears in answer to a phone call. Drivers, house servants, street sellers, they all now have mobiles. I am differentially enabled because my i-phone won’t take an Indian sim card, so until some techo-savvy person can help me sort that out, I can’t even call an Uber cab. Fortunately tuk-tuks are everywhere, rattly three-wheeler motor-scooters with metres that invariably don’t work. 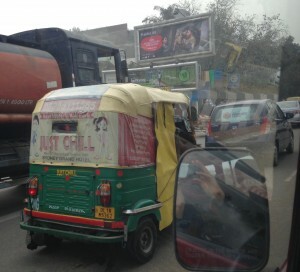 Just Chill, says an advertisement on the back of one just ahead of ours – difficult to do as you rattle along the Outer Ring Road with honking traffic eight cars deep. I’m in a friend’s car now, on our way to a meal with an eminent historian, and we’re stuck in traffic. Really stuck. We phone to explain. She is unsurprised – ‘That’s Delhi for you,’ she says. I try to imagine what it is like to be in traffic like this daily, breathing this almost brown air. On the scale of air pollution, Delhi ranks 11th of the cities in the world – that’s official. I bought a mask after I read that but I couldn’t find it when I was packing, and anyway, what is the point? It would be like expecting an umbrella to be of some use in a hurricane. 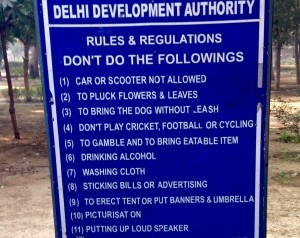 The real issue is what do long-term Delhi residents do? ‘Odd-Even’ is the current answer. 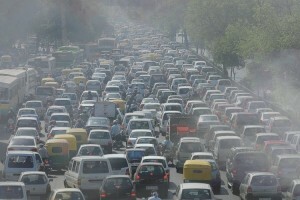 Delhi’s administration is running a two-week experiment to cut down private car use. Cars with registration numbers that end in an odd number may only be used on odd number dates, and similar for even numbers. Theoretically this should cut the numbers of vehicles to half, but there are lots of permitted exceptions. If what’s on the road at the moment is just over half the number of private cars, I can’t bear to think what it’s going to be like when the experiment comes to an end. The Metro is the answer. It’s the driver of the friend I’m staying with who instructs me on the route to the station and how the ticket system works. It’s efficient, quick, you go through airport-type security each time, with a separate queue for women which is far shorter than the men’s. Amazing, a public facility that privileges women. I am astonished that people who spend time in traffic jams hardly seem to consider it a viable option. But I didn’t pay enough attention to the route to the station, and by the time I come out of the Metro that evening it is dark and everything looks different. I walk for a long way on a busy street with shops without recognising anything, realise I must have come out at the wrong exit, backtrack and try again. There are no street names, only suburb ‘block’ names – like Green Park Block C – and no one seems to know blocks beyond their own. Each time I ask the way I get sent in a different direction. I’m also getting strange looks – a white woman out alone at night? Walking? I do now have a phone that works but my friend is out of town. I might disappear and who would know? I might become another newspaper story. Finally I recognise a building and limp home. Next day I tell the driver. He is shocked – ‘Why didn’t you phone me?’ Because he lives far away. ‘But I could have told you on the phone where to go!’ So disoriented was I, it didn’t occur to me. I am touched. Independence is all very well but I’ll swop it happily for the knowledge that someone’s looking out for me. Just chill. Uncertain Light has had its official launch. Good venue – the India International Centre. The novelist Manju Kapur interviewed me – we met years ago when we both received Commonwealth Writers’ Prizes, and we have recently rediscovered each other. The audience was small, mainly friends, and friends-of-friends who had been primed to come along. I felt supported, and we sold a few books. But that probably won’t cover the cost of the launch. The next event is on a different scale. 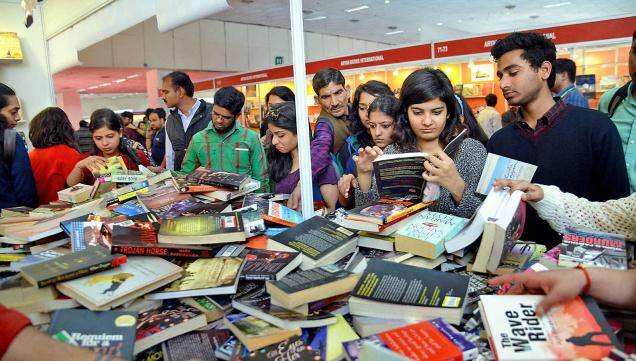 It’s in the Pragati Maidan, the vast expo centre that holds the New Delhi World Book Fair. At least twelve giant warehouse spaces are filled with publishers’ stands, and tens of thousands of people throng in – a day out, and also a chance to buy books at discount prices. No question here about the desire to read – I’ve never seen so many people after books. In each hall there is an Authors’ Corner with a rolling programme of talks. With thousands of books clamouring for attention, how clever of Speaking Tiger to get a slot for me, but with the buzz of crowds and blaring tannoy announcements will anyone want to attend a talk, or be able to hear? Yet when my turn comes they are sitting there, sixty, seventy of them, waiting — for — ? What shall I deliver this time? The well known professor of literature who was to have interviewed me was not able to do it because of illness, so my friend Shireen has stepped in at the last minute. She comes straight off a flight from Mumbai, and with no time to prepare she does an excellent job, and I just have to answer her questions. The audience is so attentive I forget the tannoy announcements. I sign a book to the youngest reader I’ve ever had – she’s thirteen and writing already. I had no concept that my book might be read by a thirteen-year old. I wonder – what will she make of it? 5. What am I doing here? When I arrive for my next talk there are three young men to make up an audience – the organisers. While we wait to see if anyone else will come I ask about their work. 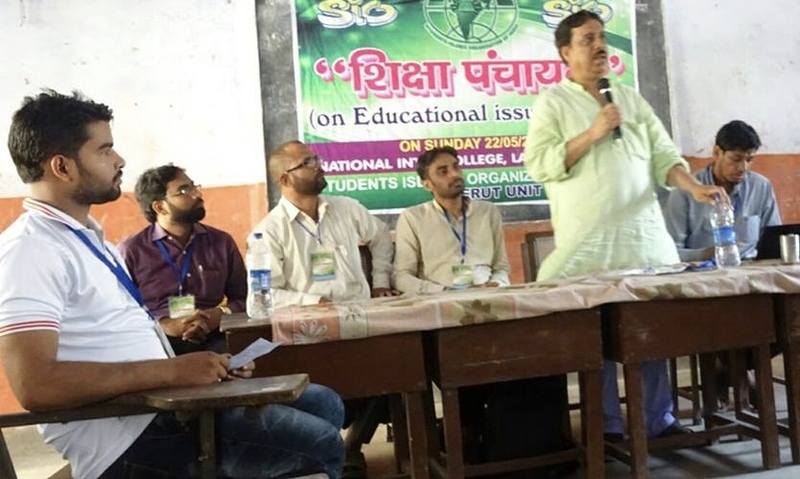 They monitor India’s law guaranteeing free education – how far is it being implemented? Local organisations across many states deliver statistical reports on the numbers of children who are still missing out. They will be, of course, the most marginalised, Dalits, oppressed minorities, and that vast group of children who can’t be at school because they have to work. One of these young men works with children who are rag-pickers – that is about as near bare-survival as you get. These are the kind of people I used to work with in Save the Children, and if I were here to learn about their experiences that would be fine, but to talk about my book —? When we were planning this I had hoped – naively, I now realise – that the setting of Uncertain Light might interest people who work in NGOs; but nothing about our conversation so far suggests that they might read novels. I am embarrassed – they have work to do – why am I wasting their time? Perhaps no one else will come and we can call it off? A couple more have arrived – we chat – I am finding it difficult to follow some of their accents in English, so presumably they are finding it equally difficult to follow mine. They begin piling books out of a box – copies of my book – they have come from the publisher. The pile is embarrassingly large. A few more people drift in, including a woman who is introduced as the CEO of the host organisation for this building. Have they been summoned to save my face, to make up an audience for this visiting foreigner? The convenor says we should start. I’m thinking that I could perhaps make this work if we could sit in a comfortable circle and I could get them talking, but the room itself imposes formality – we are seated around a heavy, immovable table. I am introduced, and I talk briefly about what led me to write this book, then try to encourage questions. Someone asks about my background in apartheid South Africa – great, that’s a lead. I abandon Uncertain Light and talk instead about If you can walk, you can dance, my novel that starts with anti-apartheid activists having to flee. It’s as good a starting point as any – I’ve always been surrounded by people of other cultures, always been interested in exploring what that means for people, but the more you delve into what makes us different, the more you discover the universal things that make us all human. In If you can walk, you can dance, music is a metaphor for that – it’s different in each culture, but people everywhere respond to music … By now they’re looking positively engaged. I abandon caution and sing an African song that appears in the book – a woman calling from a distant hill-top, loud and uninhibited. The young men are grinning awkwardly (this is not what happens in meetings in this room) but it has jolted them out of reserve. In India, one says, we have something worse than apartheid – caste. Maybe you can write a story challenging caste issues? Not me, I say, I don’t have the experience, but there are wonderful books being written by Dalits and Adivasis themselves, and Speaking Tiger is publishing some. It’s time to end. The woman astonishes me by announcing that they will buy four copies of my book for their library. Four of the men buy their own copies. One comes up quietly afterwards to say that if he likes it he might translate it into Hindi. So much for my assumption that they are unlikely to read novels. I am not sure whether those who bought copies are just doing it to boost my morale, but I feel absurdly pleased at having sung to them – some light relief in their report-writing-computer-dominated day. 6. Miranda House kahan hai? Now for my last event, a lunch-hour talk to the Literary Society of Miranda House, the oldest and most prestigious women’s college of Delhi University. The taxi driver has never heard of it and has difficulty repeating the name. My friend’s driver, who is still looking after me, instructs the taxi driver, then turns to me and says, ‘Why you not go by metro? Much easier.’ I can’t imagine why. For a moment I must have slipped back into the habits of those around me and assumed a car would get me there quicker; big mistake. But now I have engaged this taxi driver I can’t turn him off. The journey takes forever – I am afraid we are leaving the city and will never arrive. When we think we must be nearly there the driver stops to ask people at the roadside – Miranda House kahan hai? – Where is Miranda House? No one has any idea. 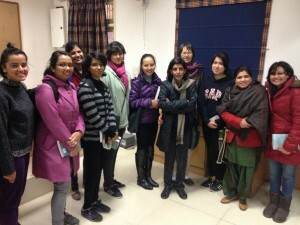 We try again a little further on – Delhi University? – Miranda House? Women’s college? No idea. We turn a corner – and here it is, right here, fifty yards from all those people who had never heard of it. It’s an impressive heritage building with large gates and the name written up. Every day the passers-by must see hundreds of young women coming towards it, going away. Well, that puts things usefully in perspective – just how peripheral university-educated people, and writers and books are in the lives of most people. The event has been set up by a teacher here, who is also a novelist, and the young women coming to listen to me are mostly doing degrees in English Literature. While we wait for everyone to assemble I ask those already here what writers they are studying. Every writer from Chaucer on, it seems, in a syllabus so packed I wonder how they ever get time to read books being written now. By the time we get going there must be about eighty young women in the lecture room. They’re listening rather too respectfully, and as usual I am feeling for clues as to what might interest them. Do they themselves write, or aim to write? Who chooses to study literature without at least a secret fantasy of writing? Someone asks about how easy it was to get a publisher. That makes me laugh, which is not the reaction they expect, so I begin telling them about the decades of rejections and resorting to self-publishing. They love every story of going-it-alone, of refusing to give up, of literary prizes that proved those rejections wrong. Their laughter eggs me on and it turns into a hilarious session. Despite the heavy weight of Chaucer and the rest of the literary canon, all the copies of Uncertain Light that the publisher has sent disappear. A small group stays chatting, the laughter still on their faces when someone says, ‘We need a photo.’ It will remind me of the moment when I ceased to be the successful author they thought they had come to hear, and became instead a person like them, who writes for the love of it and wonders whether anyone out there might be listening. Thank you to all who helped launch Uncertain Light in Delhi, especially Renuka Chatterjee, Gillian Wright, Suchishree Sen Gupta, Manju Kapur, Shireen Vakil Miller, Ambarish Rai, Ira Singh, Surajit Sengupta. Photo credits: Ravi Singh/Speaking Tiger, interview in Scroll-in, Jan 21, 2015. 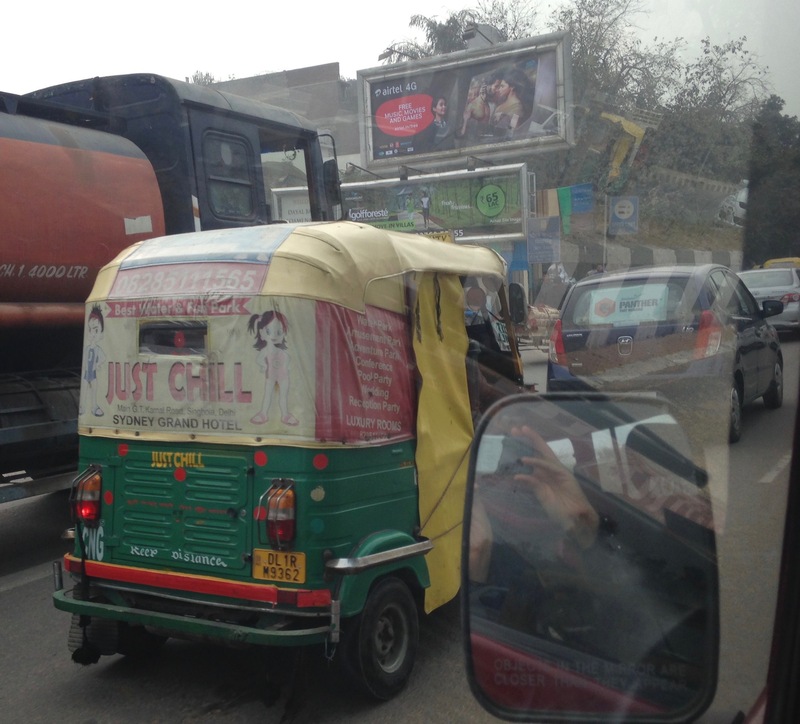 Delhi traffic – The Logical Indian, Dec 6, 2015. 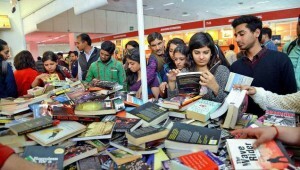 Delhi Book Fair – Speaking Tiger. 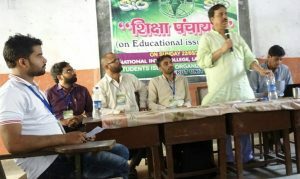 Meeting of the Right To Education Forum, Ambarish Rai. Miranda House group, Ira Singh. Loved reading this. Love the writing. Love the humanity- how we all feel the same. 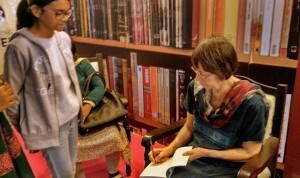 I enjoyed reading your latest blog Marion and the wonderful descriptions and impressions of India and meetings to launch the Indian edition of your book. Congratulations ! Oh my word Marion. Last year I spent 3 weeks in India, well nearly a month. First an international Fed of Theatre Research Conference in Hyderabad Uni, then 6 days of teaching 3 hrs per day to 20 post-grads and then 5 days of ‘touring’ ho ho. Your blog is totally a revisit of my trip, except I was in Hyderabad which, as you know, is hardly Delhi! I travelled by train – it took 90mins to the centre from the Uni and cost me 10 rupees in the woman’s carriage. They didn’t want me to go but finally relented and one of the students took me on my first outing: to the very heart of Hyderabad on one of the final evenings of ‘Ramjan” – Ramadaan. Heavens. But you have it all down in this blog. Bless you. What a tour de force! Far, far more than one expects when one clicks on a blog. So many interesting stories there, about different bits of your life and different aspects of India. If I may make a suggestion, what about posting much less in each blog? You could have got five interesting blogs out of all that material. People will quickly learn that they are well worth clicking on. Thank you Marion, I really enjoyed your blog – I had been busy with visitors and unable to get to it, but was so happy when time permitted me to do so. At almost 92, I do not do Facebook, so am delighted you sent this by email. I hope it will eventually find its way into another book – there is a desperate need for the understanding of other cultures that you demonstrate so vividly. Good luck with your good work, I look forward to reading more of it.